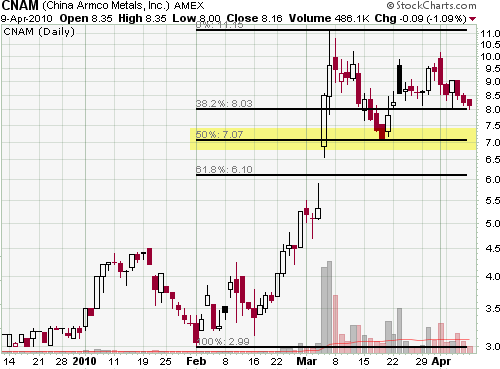 I don't look at Fibonacci retracements very often. That is because I really don't find them very useful. Most stocks will reverse at a support or resistance level as determined by the prior price action - not a Fibonacci number. 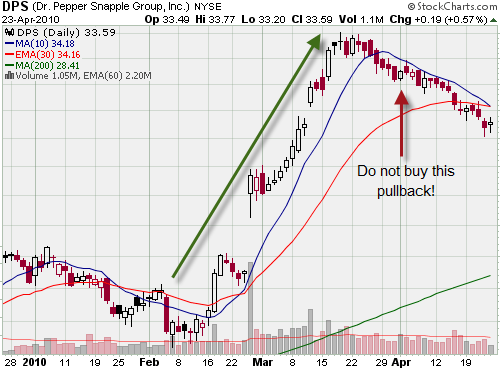 This stock rallied strongly and then began to pull back. But, there wasn't an obvious support level to halt the decline. In a scenario like this, drawing in Fibonacci retracements can be useful to get a general idea of where this stock might reverse. In this example, CNAM reversed right at the 50% level with a powerful reversal candle to back it up. Many stocks reverse at that magical 50% mark. The funny thing here is that the number 50 doesn't have anything to do with Fibonacci! 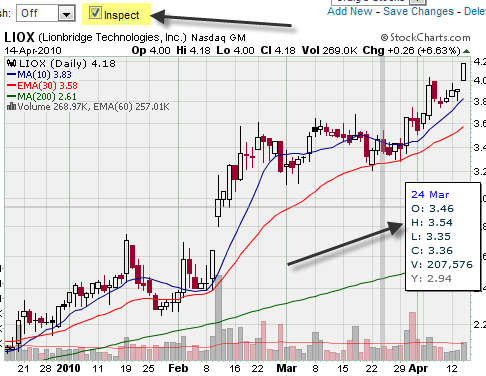 Stockcharts.com has added a nifty new "Inspect" feature on their SharpCharts. Just check the Inspect box and move you mouse over the chart. A box will pop up that shows you the high, low, open, etc. of any candle on the chart. Click on the chart to cycle through the different display modes. This is a big time saver for me because I always want to know what the previous days high or low is. Now it just takes seconds to find out. The iPad is the first Apple product that I have ever owned! And, after using this iPad for awhile, I can see what all the fuss is about. It just works the way a computer should work. I bought it for a variety of reasons but the most important thing was portability. I needed something to check my stocks and read my email when I am on vacation. And this does the job nicely - without having to lug around a bulky laptop. The picture really doesn't do it justice because it is hard to get a good picture of it with the glass screen. The colors are just so vibrant and crisp. The picture quality is simply amazing. I was also amazed at how easy it is to navigate the internet, click on links, type in search boxes, etc. The touch screen is simple to use and not awkward like I thought it was going to be. And did I mention, it is fast? 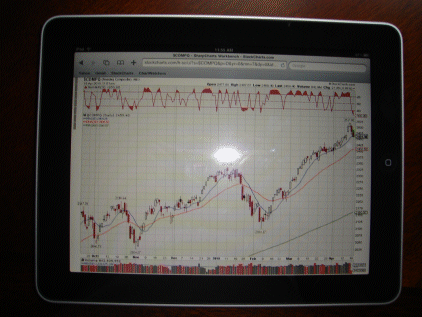 There are also quite a few apps that you can download to your iPad that are business and finance related. One app that I downloaded is a Bloomberg app (free) which gives you stock quotes, news, and a nice portfolio for tracking your stocks. You can also download books and read them on your iPad through the iBooks app. I read a lot so this feature is really nice. There is also a stunning word processing program called Pages that makes it real easy to create documents. Nice. And of course you can watch videos, store your photos, listen to music, and play games. So, if you are thinking about getting a laptop, or a second computer (or monitor) for trading stocks, head on over to your Apple store and try out the iPad first. I think you will like it as much as I do! The stock market has had a huge run recently and many stocks have followed suit. But, you have to be careful of trading pullbacks after strong momentum moves. When a stock enters "momentum mode", it tends to stay above the 10 period moving average with no significant correction for a long period of time. Trading pullbacks after strong momentum moves can be a dangerous undertaking. All of the traders that were long this stock got nervous when the stock broke its momentum. And every time it tried to rally, they sold. This caused enormous selling pressure - and the pullback failed. You may have considered trading this stock when it pulled back, but you should have anticipated that selling pressure would come into this stock after the big momentum run prior to the pullback. So, beware of pullbacks after strong momentum runs. They often lead to consolidations and failures. This causes frustration and frequent stops outs which can lead to losing trades.